Welcome to Lady Houston Chapter website. If you are interested in joining a DAR chapter and live in the Kingwood, TX area, please click on the Membership Inquiries link on the left navigation bar. We also invite you to visit the other links on the left. On Sunday, October 11, 1988, Lady Houston Chapter installed its first officers, with 35 organizing members. 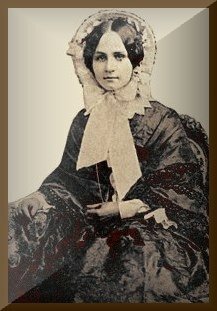 The members chose to bear the name of Lady Houston in honor of Margaret Lea Houston, daughter of Temple and Nancy Moffette Lea and wife of Sam Houston. Learn more about Margaret Lea Houston by clicking the link in the navigation bar to the left. For questions about this website contact the webmaster.